Instagram Push Notification gives an alert to account holder when Instagrammer get likes, comments, Comments likes, Instagram Direct, Follower requests, Live videos, Reminders, Supports claims and many other. These all alerts are customizable, and only able to receive in turn on Instagram Notifications on iPhone. It is straightforward to do that Even though, Lot of guys are asking they can’t find Instagram notifications in Settings on the iPhone? At a glance, it seems like really really an unsolved glitch. But, it can resolve. New Settings, in iOS 12 Notifications in Group by App, Manually. Even on my iPhone XS Max, XS, XR, X and iPhone 8 Plus running iOS 12, I can’t find Instagram Notifications in iPhone Settings App. At that time, I tried below-listed troubleshooting. Have you the same issue? Go down and read carefully all the steps to fix. Step 1. Tap and hold the Instagram app icon on your iPhone Home Screen. 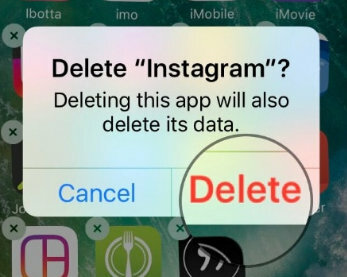 Whenever the screen starts to jiggle tap on X sign to uninstall Instagram, tap on Delete on the bottom of the available message. Then press the home button to go back on the home screen. Now, go to App Store and navigate the Instagram App to re-install. After this, enter Username and Password to log-in. ‘‘Instagram’’ Would like to send you Notifications. Step 2. Tap on Allow. And get back missing notification tab inside the Settings App. Watch the following video and get a clear idea after this don’t forget to subscribe to my youtube channel [HowtoiSolve] for the latest tips & Tricks. Now, go to Settings App → tap Notifications → Find Instagram. Show on Lock screen used to get or hide notification on locked screen iPhone. In the end, what type of style of notification on screen, you’d like to get for available None, banners (appear at the top of the screen at a move away automatically) and Alerts (require action before processing). Okay, So enjoy Instagram Push notifications when people follow you or like and comment on your Photos or videos. Manage all types of notification alerts like Like Notifications, Comments Likes & Comments Notifications, New Followers Notifications, Photos and Stories notifications, Live Video notifications. This post also helpful when noticed notifications not showing up in settings for applications like Facebook Messanger, Whatsapp, Snapchat, Skype and other massive demand famous apps not getting text notifications. Hello friends, hope you got the fix. Leave your feedback in the comments box below. You also find us on Facebook and follow us on Twitter. Genuinely no matter if someone doesn’t understand afterward its up to other people that they will assist, so here is best place.